What do chickens eat you ask? OK, no one asked but that’s what I feel like talking about today. 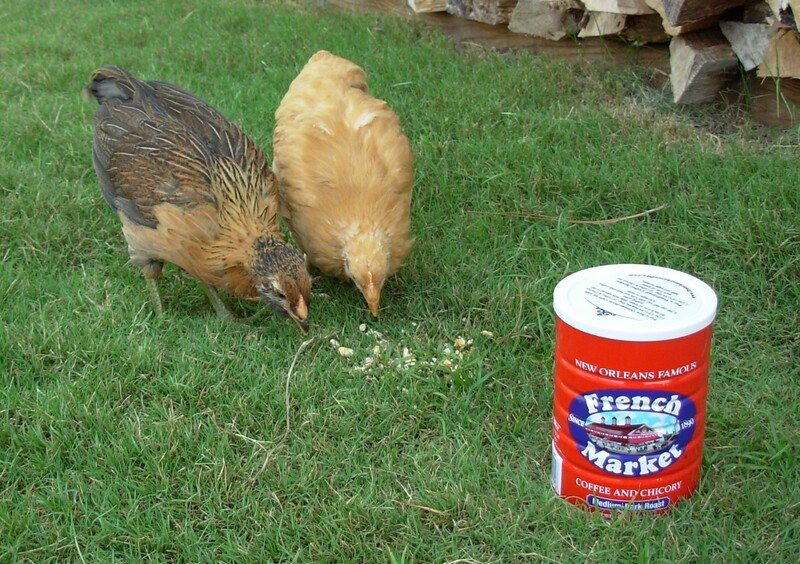 For the first four months of their life, the main staple of their diet is chick starter. This early food is higher in protein and lower in calories than the layer ration they will start eating sometime in early September. Since they were a few days old, my girls have been eating hand-caught bugs (see Bugs Are Tasty, April 27, & Bugs Revisited, May 11). Now they catch their own bugs in their coop and in the back yard. They will eat almost anything we eat. On hot days I give them watermelon rind (I leave some red on it). When they are done, the entire white rind is gone; only the thin green skin is left. I keep a bowl of kitchen scraps on my kitchen counter for treats. It contains everything from carrot skin, to slightly old grapes and cherries to stale bread and eggshells. I have a compost crock and two composters in the yard, but now it seems that the girls are doing most of the composting for me. You can also feed them something called scratch. This is like candy for chickens. They love it, but too much is not good for them. Scratch is a mixture of different grains, usually cracked corn, wheat and oats. A handsome farmer boy I met at the feed store told me he uses scratch to train his chickens to come when he calls. He has a coffee can containing scratch that he shakes and calls “chick, chick, chick!” He pours some of it on the ground in front of them and they get the idea to come running when they hear the noise. Of course I had to find a red coffee can at the grocery store to coordinate nicely with their red coop and feeders. I looked for Community, but all they had was this French Market Coffee. I’ll let you know if it’s any good later. (I emptied it and put it in a baggie in the freezer.) 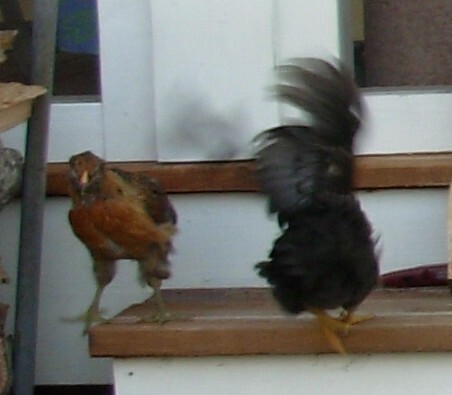 So far, Violet, Rosie & Daisy don’t get the “shake-shake, chick-chick, scratch” connection. The shaking sound scares them and they run away before they can see that the yummy food comes from the scary can. They eventually find the pile of scratch but I don’t think their tiny brains understand that it comes from the pretty red coffee can. I put it near the scratch so at least they can see that the can and the scratch are “friends”. Chickens who forage, as mine do for about two hours every day don’t really need “grit” but you can supplement a chicken’s diet with this if you wish. Grit is like roughage for them. Foraging chickens pick up tiny stones, sand and dirt to help grind their food. Chicken digestion is fascinating, (OK maybe just to me). Food is stored in the crop. Usually, at the end of about four hours, the food moves down to the first stomach, (who knew?) and then on to the second stomach, otherwise known as the gizzard. Since chickens have no teeth their food is ground up in their gizzard. Any gritty material the chicken has consumed during the day is ground up here. Then, on to the small and large intestine and then voila! Out the vent. (yes, it’s called a “vent”) I’m sure this is way more info than you were ready for, especially if you haven’t had breakfast. I’m just all about the quest for knowledge today. I’ll try to be less educational in my next post. PS, I was gonna call this one “Venting” but I changed my mind. Aren’t you glad? Those chicks will learn quickly to associate cafe du monde coffee can with their treats. I keep deer and fox food in coffee cans. Stepped out on the deck last week and mama deer appeared with three new babies. Nothing like animals to make our day! Love reading your chick updates. Obviously your beautiful deer have bigger brains than by babies. And I didn’t get Cafe du Monde coffee, cuz that can is yellow and doesn’t go with my color scheme! 🙂 I miss you and Uncle Sonny so much! Very educational plus fun, I enjoyed learning all about chicks! I live to serve, Cindy!